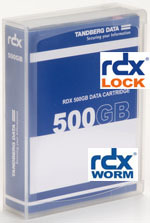 The new rdxLOCK Software for Compliance Archiving: Save your regulatory compliant data on RDX WORM Media! WORM (Write Once Read Many) is a technology that prevents data from being deleted, changed or overwritten. WORM is primarily used to meet regulatory compliance requirements of archiving applications, like enterprise content management, document management systems, patient files like PACS, video and voice recording or technical documentation. 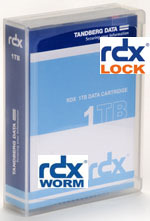 Tandberg Data RDX WORM media and rdxLOCK software is available at BackupWorks.com. We now have a new version with much more features like individual retention on directory level. This “frees up” WORM of files in a directory after compliance archiving period is expired. Now these files can be deleted or overwritten.